Sometimes you pass a monument and the only thought in your head is, “??!??”. There is no sign, at best there is a confusing year number, and the passing locals seem to not even notice this thing’s existence. What are they? Why are they? So many questions and no answers. 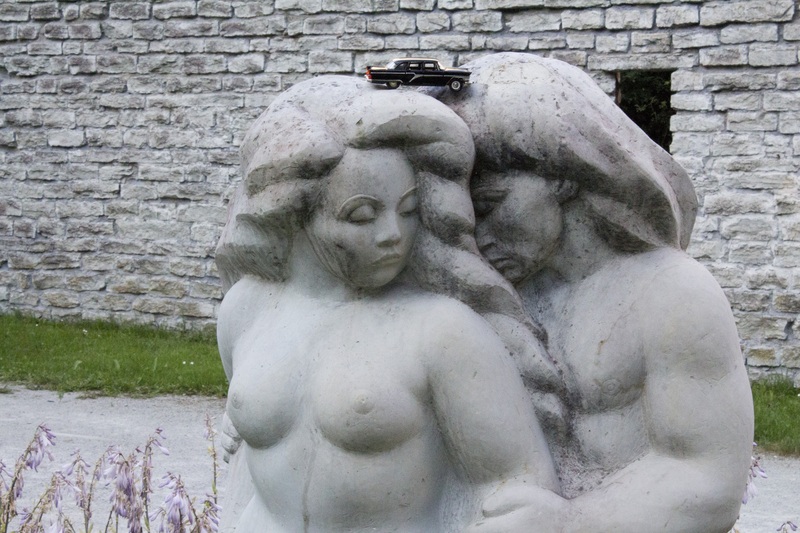 Tallinn has quite a few confusing monuments. So, in the name of knowledge, we took a road trip through some of them (not all, because that would be impossible). Any road trip must be undertaken in style. We didn’t rent some western corvette or a modern beauty. No! 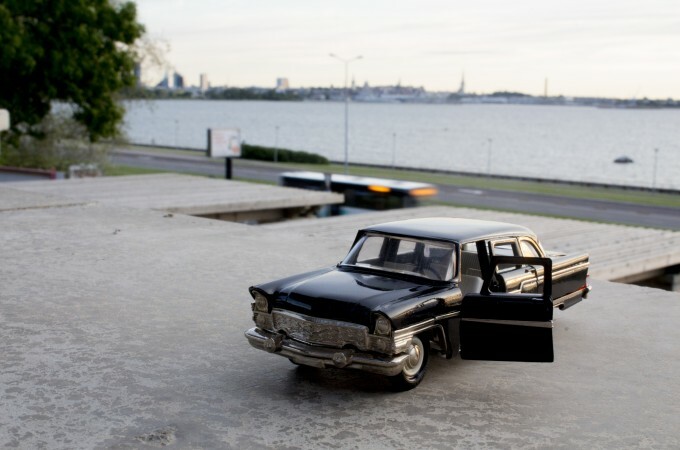 Here is the true master class – the Chaika Gaz-13, Soviet era luxury wheels. 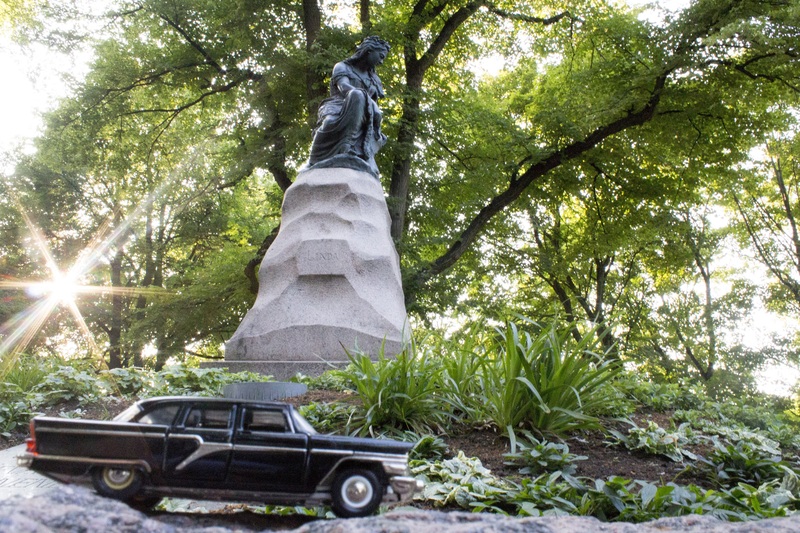 Chaika means seagull and it was mainly used as a limousine by the communist party’s high officials. 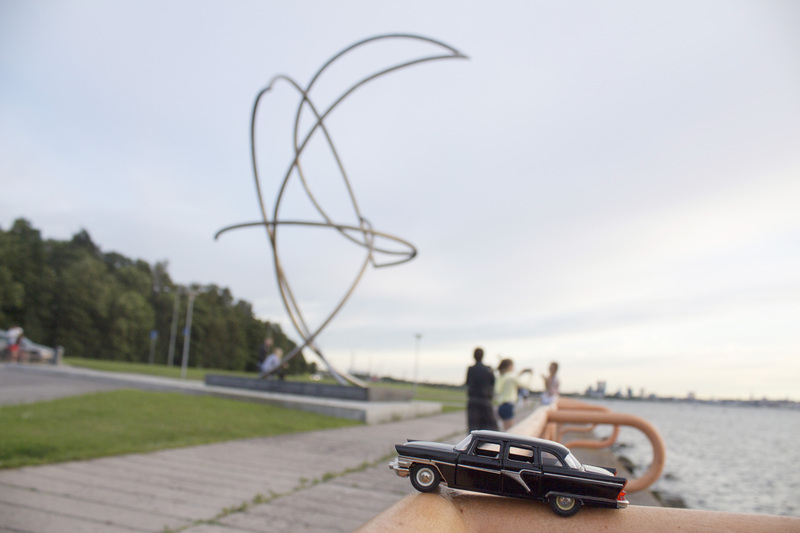 This sleek model was provided by our fellow tour guide Mart whose father collected model cars as a child. The photos were taken by the talented Ann and the text is by yours truly. 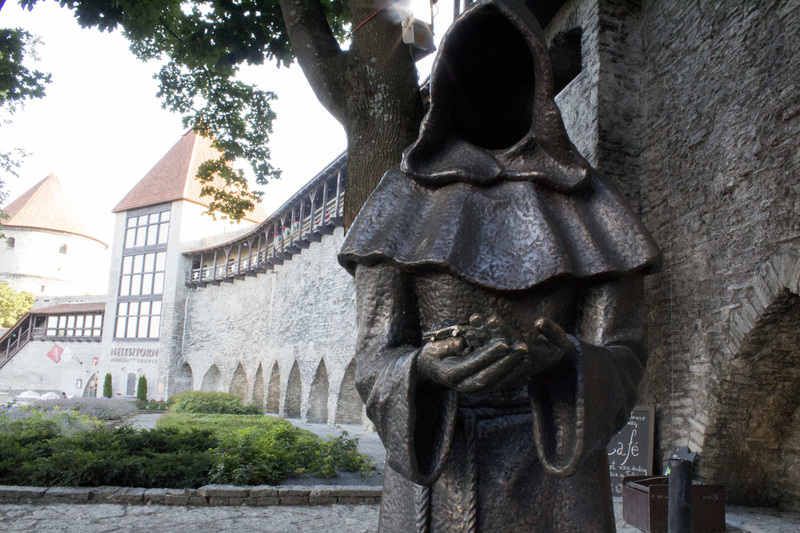 The good, the bad, and the confusing – here are some of Tallinn’s monuments explained. There was a movement in 1980s in Poland called Solidarity (check it out, it was important!). A movement like that gave hope all over the Eastern Bloc that change was possible and that people actually might have some power. This was another straw added to the Soviet camel’s back that ended up breaking it. 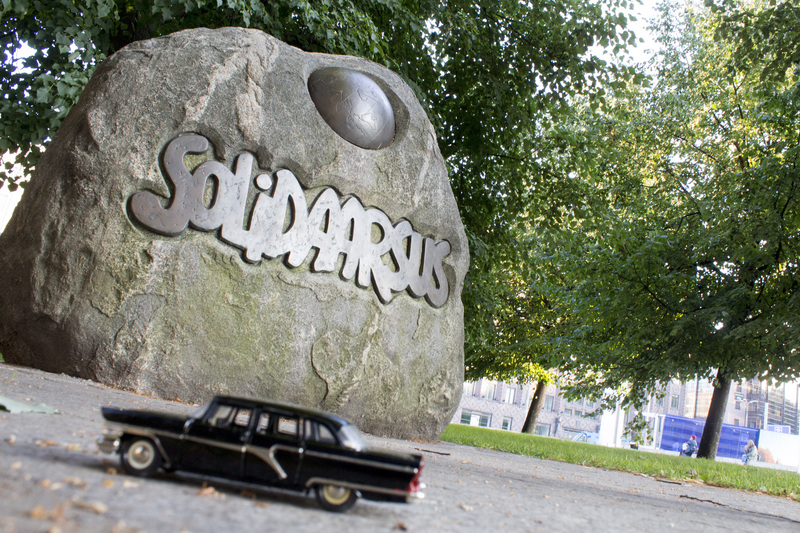 So the Polish Embassy funded the making of this rock in Tallinn to show that there is solidarity here with Solidarity. On top of the Swedish Bastion sits Linda. She is a woman from Estonian mythology. Her husband was Kalev, leader of ancient Estonians, and when he died she mourned. She built his burial mountain (Toompea) and cried us a lake (Ülemiste). Understandably she tried to keep busy and never did notice that her three sons were at the same time deciding who would get to be the king now. They threw giant rocks to settle that one. Who are they? How did they get here? Why are they? Meet Ambrosius, Bartholomeus, and Claudius. These three fellows are monks in the Danish King Garden. Their creation was funded by a shady Estonian businessman Toomas Annus. We can only speculate what he got out of that other than a reward from the city for The Deed of the Year. Clearly the city doesn’t have enough strange statues and needs creepifying up. But they should also have something to do with the legend of the Danish flag. The monks might have prayed with the Danish king for godly intervention during a losing battle. And a quick deus ex machina later, Denmark was up one flag and Estonians were out of freedom. Boris Jeltsin is a legendary man. The story goes that once upon a time two presidents, an Estonian and a Russian one, sat down to talk about some things. Like the continued presence of Russian army in Estonia in 1994. Lennart Meri wanted them gone and Boris Jeltsin wanted them to stay. Between these two opinions there seemed to be no middle ground until Jeltsin had a brilliant idea – things should be settled traditionally – over vodka! Et voilà, an agreement was signed, the Russian army left by the end of 1994, and the rest is history. Martin writes more about this in his blog post. Chimneysweeps are considered lucky in Estonia and when you see one you are supposed to rub one of their jacket’s brass buttons so as to catch some of that luck. 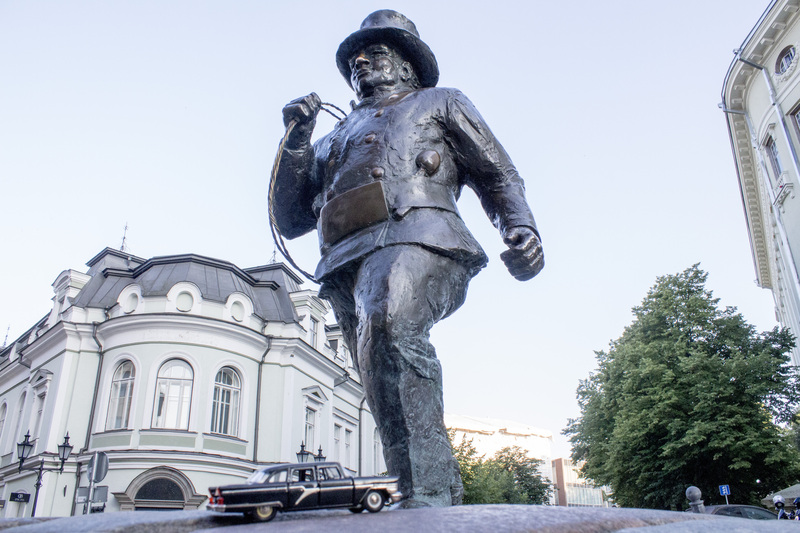 This bronze statue, though, is by the luckiest sculptor in Tallinn – Tauno Kangro – who has blessed our city with many overpriced monuments with questionable taste level. This gift to the city by the hotel across the street only pains drivers in the already narrow old town street and draws the attention of tourists taking pictures of just about anything. Okay, trust me, this is a mermaid. In 1980 Moscow hosted the Olympic Games, and they didn’t go down the best, as many boycotted the games. Not the only problem with the games though. The landlocked city of Moscow had an issue with the regatta, like… where to hold it. Tallinn got the honour of it, only to be double-boycotted during the games. No matter, we still celebrated it! So, here is a monument in the honour of the 1980’s regatta. 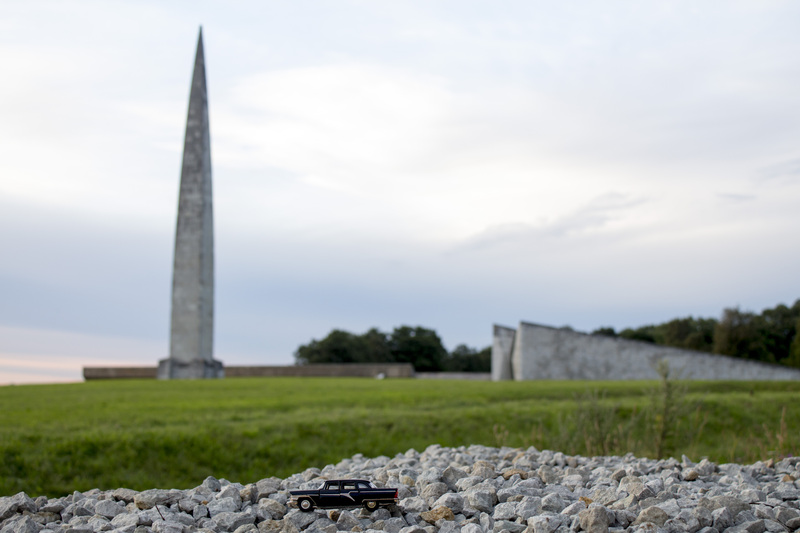 This unavoidable massive memorial by the Pirita road is dedicated to all those who have fallen in defence of Estonia. 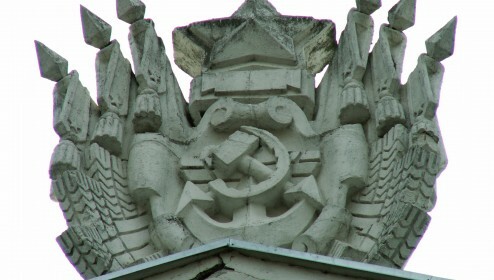 For the year 1975 this was rather un-soviet wording and from the look of it the monument also doesn’t sport any of the expected hammers, sickles, or big red stars. Maybe this was due to the sheer number of architects and artists included in the project but they couldn’t agree on much of the design and thus dragged out the finishing touches until re-independence. Does anyone call Estonians slow?! Once upon a time there was a man named Charles Leroux, he was an American airman and skydiving pioneer. In 1889 he took to air over Tallinn with a hot air balloon to jump off it with his self-designed parachute. Due to strong wind the balloon was carried out to the sea and as a last resort Leroux decided to jump (it was his 239th jump). He didn’t make it. A hundred years later this modernist abstract sculpture was erected in his and every other brave man’s honour (including but not limited to sailors, surfers, skydivers, racers, and pilots). Apparently there used to be an ancient holy site here with a completely different stone that according to a legend might or might not have had Linda petrified in it (You remember Linda? She was mentioned above, she was a little important in mythology). But it got destroyed in the 19th century when someone made fire on it (oops!). So a new stone was in order! 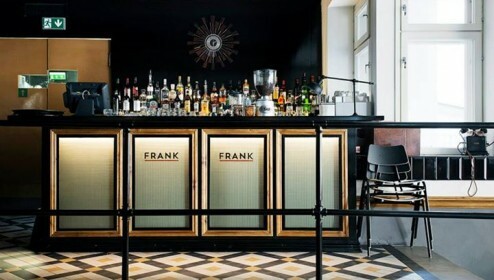 In 1970 this beauty made by Juhan Raudsepp was installed. 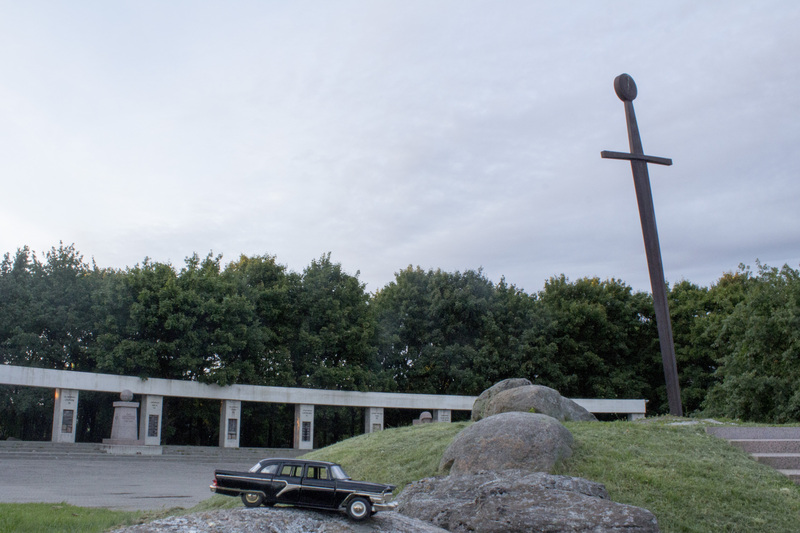 The arc, the big sword, and the trees – this is a memorial to all who have fought for Estonian independence and freedom. St George’s Night uprising started in 1343 and was an attempt for Estonians to get rid of foreign conquerors and take back the land. It failed. 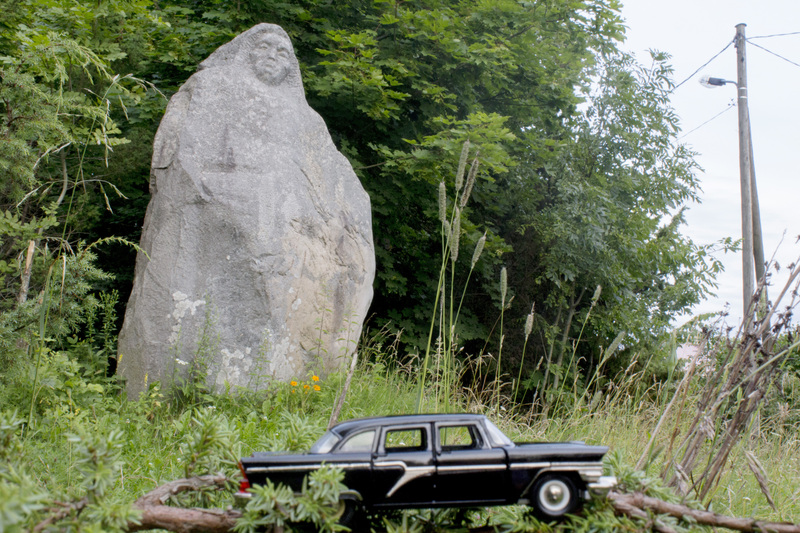 In 1930s the project for this memorial was started and it was supposed to have hundreds of trees like in ancient Estonian holy sites. 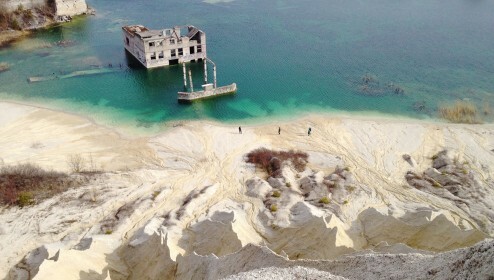 The building stopped before World War II and all the planted trees were lost during the war. In 1995 the idea was picked up again and realized in this manner. We do hope that no one is supposed to pull this sword out of its stone. Is it a man? Is it a devil? No! It’s Kalevipoeg! Well, or so we are to believe. 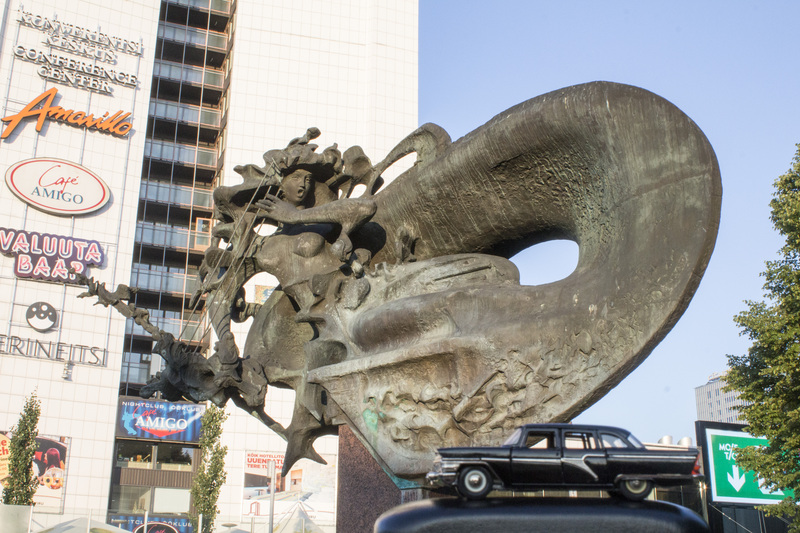 Ever since this statue was first created everyone has called it the devil (It’s the horns!). Nikolai von Glehn had this hero (Kalevipoeg is the hero from the Estonian national epic) modelled after himself (only four times bigger) and put up in his park in Nõmme. During the First World War the original statue was blown up because von Glehn was suspected of espionage and destroying his art project was somehow going to stop him… But the monument was so funky we made one again! In 1990 Mati Karmin recreated the Devil, oh, sorry Kalevipoeg. You walk down a nice small street and bam! there is a cross all of a sudden. 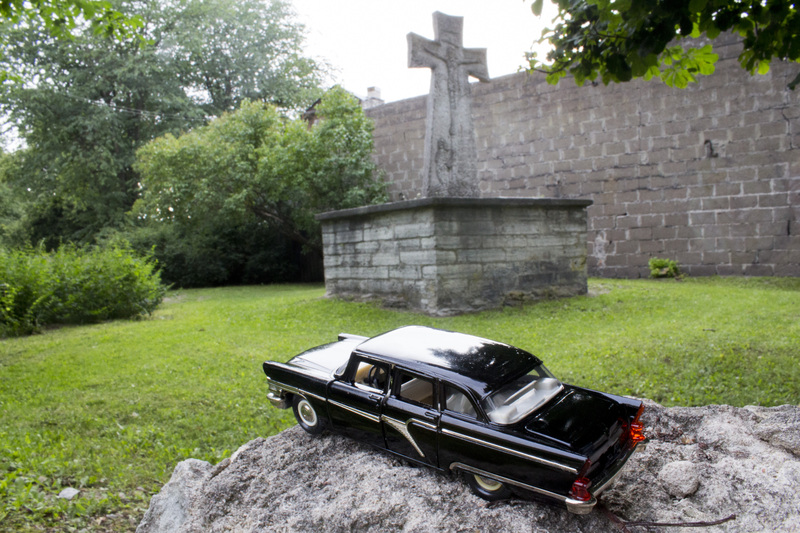 Now everywhere else – maybe, but in Estonia one does not expect crosses just like that. There must be an explanation! So, once upon a time there was the Livonian-Russian War (1558–1561) and in it there was a man called Blasius Hochgrewe. He died. Was it a heroic sacrifice or a inglorious demise we don’t know. 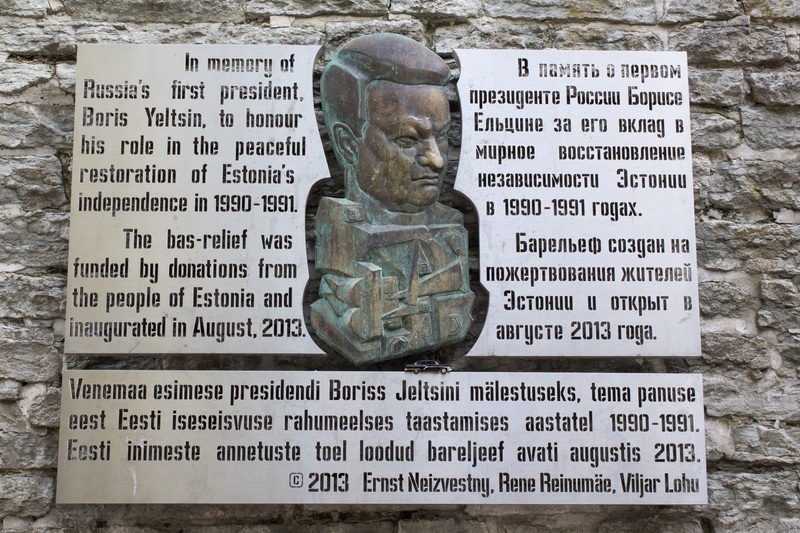 But he fought for Tallinn (well, Reval, but potato-potahto). He was probably rich and/or well-loved because in his honour a monument was erected. Now this oldest monument in Tallinn is also its best kept secret on Marta street. Is there a statue of a “berserker” in Tallin? Wow it’s amazing you know the stories behind these monuments. Too bad I just left Tallinn. I wonder if there are more details about the faceless monk statues?